Whole Wheat No-Knead Bread is marvelous. 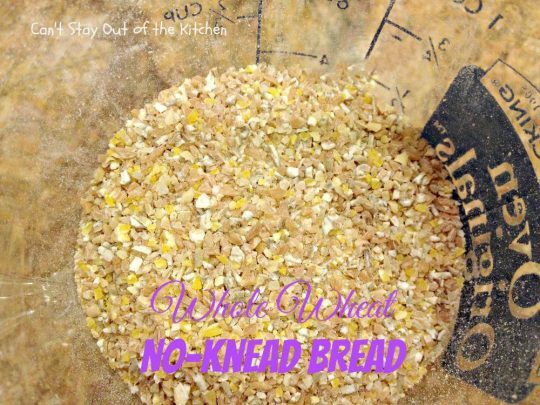 I wanted to see if it was possible to make a delicious no-knead bread with wheat flour and heavy cereal grains added to the mix. Yes, it can be done! 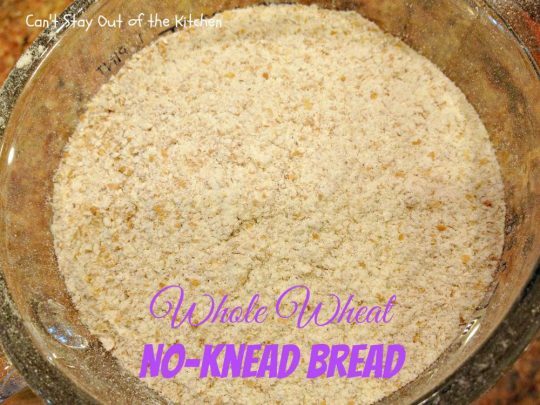 The key, as I’ve stated many times before on any of my breadmaker whole wheat recipes is vital wheat gluten. 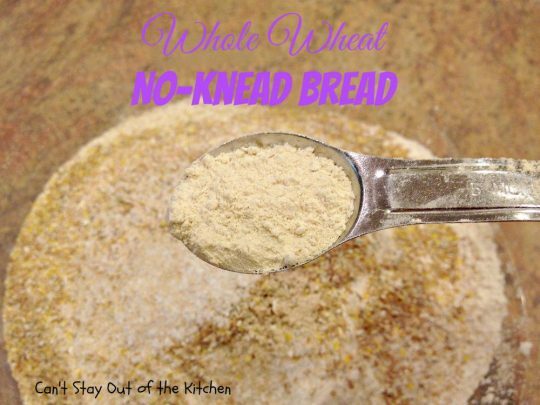 I added vital wheat gluten to the basic recipe–along with a lot of other ingredients and got a really nice artisan-type bread that’s healthy as well. Whole Wheat No-Knead Bread is filled with Romano cheese, Italian seasoning, ten-grain cereal, and whole wheat flour. Parsley and chives also add flavor. 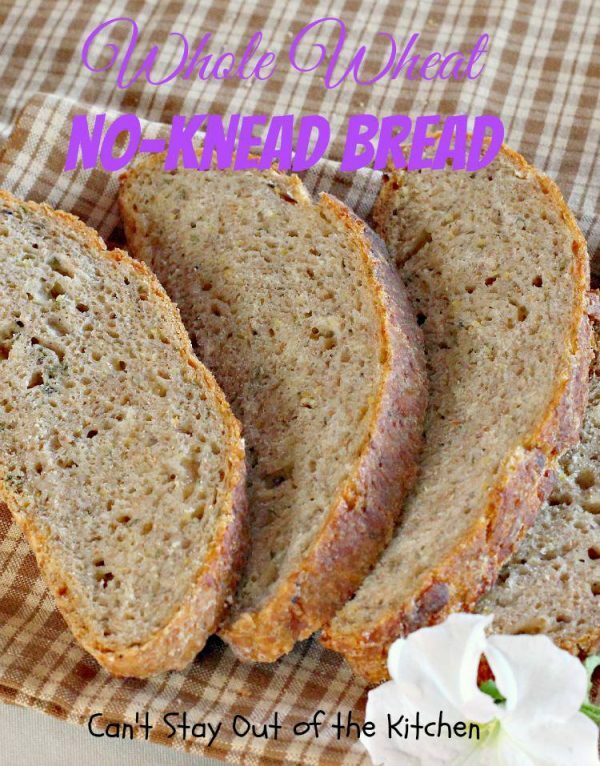 This is a great bread to use for sandwiches as it is a very substantial bread and doesn’t fall apart easily. Adding the vital wheat gluten made this bread softer in texture than regular Crusty Bread, which I liked as it was easier to bite into. Because the flour is soaked and fermented before you bake it, the dough releases the good enzymes needed to digest the bread (and which cause gluten intolerance) and removes the phythates which cause indigestion, bloating, gas, etc., in those with sensitivities to normal breads. I was so happy with the way this bread turned out. Yes, it raised wonderfully, and had I put the dough in a smaller Dutch oven to bake it, the bread would have plumped up even more. I purposely added the ten-grain cereal to the already heavy whole wheat flour to see if this would work. Yes, vital wheat gluten helped the bread dough raise adequately even in a no-knead bread! Yay! 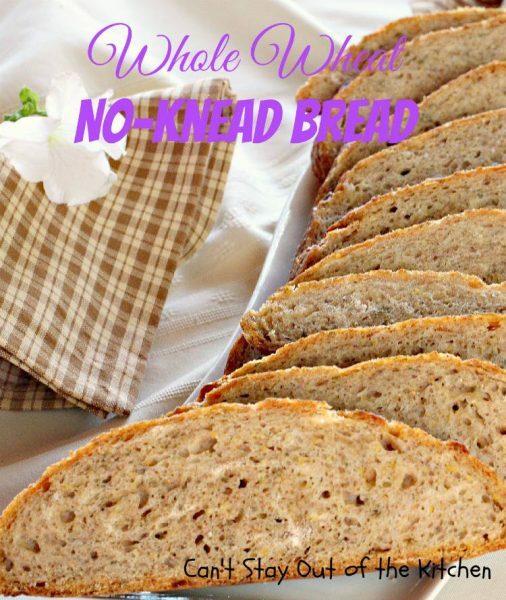 If you are looking for a whole grain wheat bread recipe that you don’t have to knead, then consider this quick and easy recipe. If you don’t want to include the cheese and seasonings you can leave them out or substitute others you prefer, although I thought the ones I used added a lot to the texture and taste of the bread. 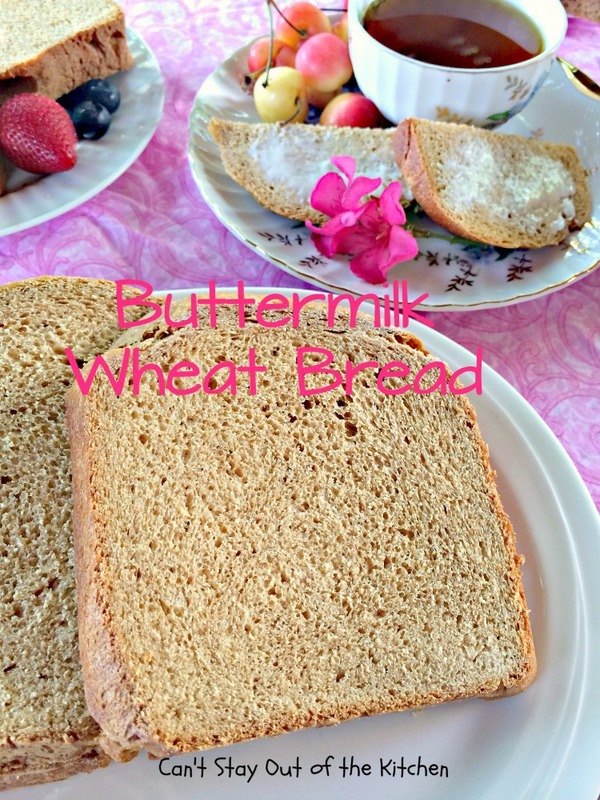 I could smell the rye from the ten-grain cereal as this bread was cooking! But you could substitute cracked wheat, a five-or seven-grain cereal, even oatmeal for the ten-grain cereal if you prefer. Parmesan or Asiago cheese would also probably work just as well as the romano. I had grated some romano a few weeks ago and wanted to use it up before it went bad so that’s why I chose romano cheese. I was so happy whenWhole Wheat No-Knead Bread turned out nicely. Vital wheat gluten makes all the difference in the world in having heavy wheat breads raise appropriately. 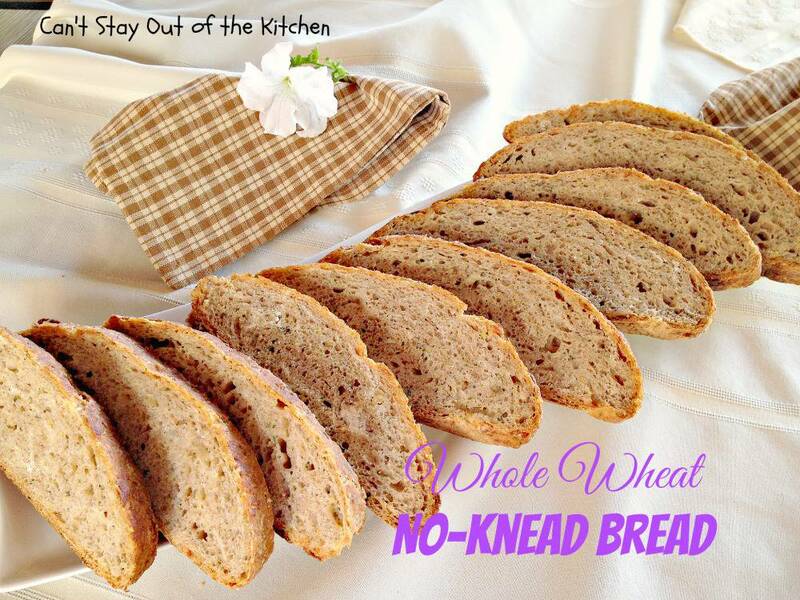 Whole Wheat No-Knead Bread is a very hearty and filling bread. When I made a sandwich out of it, I could only eat half at one time! This close up shows the texture of the bread. 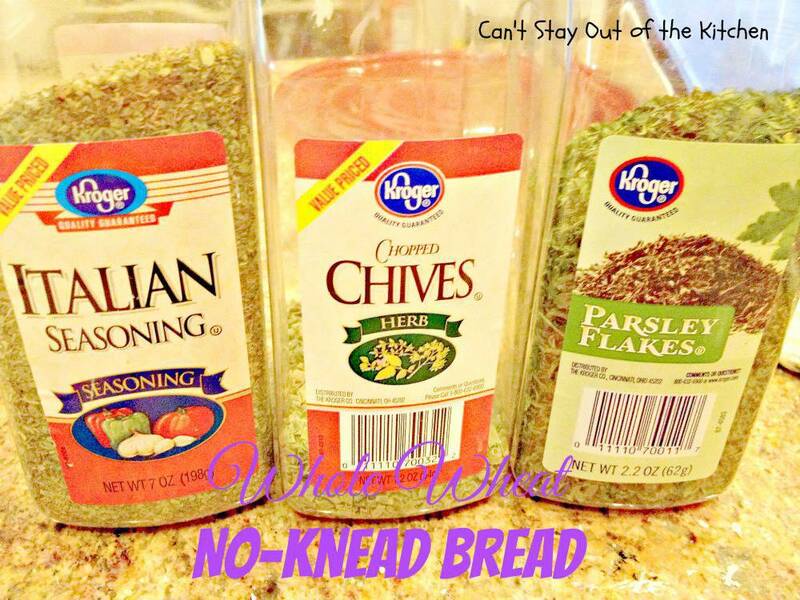 I added parsley, chives, Italian seasoning and romano cheese to this loaf. The white streaks are the romano cheese. 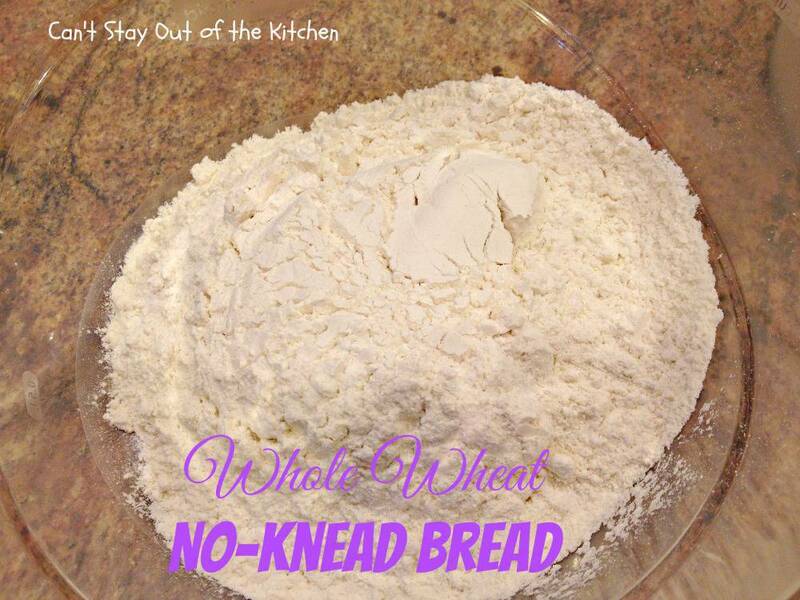 Place bread flour in a large plastic bowl that has a lid. Don’t use all purpose flour. 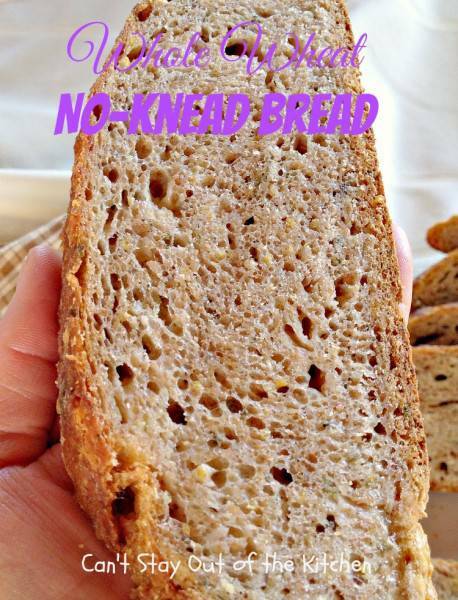 It doesn’t have as much gluten as bread flour. The whole key to making this bread raise appropriately is to make sure there is enough gluten. This is what whole wheat flour looks like. 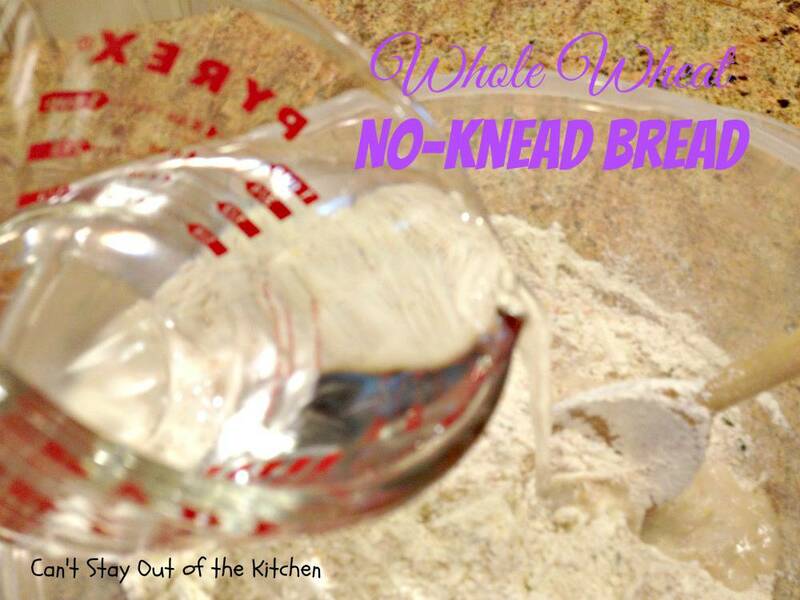 Add it to the bread flour in the bowl. I used 10-grain cereal. You can use five-grain, seven-grain or even oatmeal or rye flour if you desire. 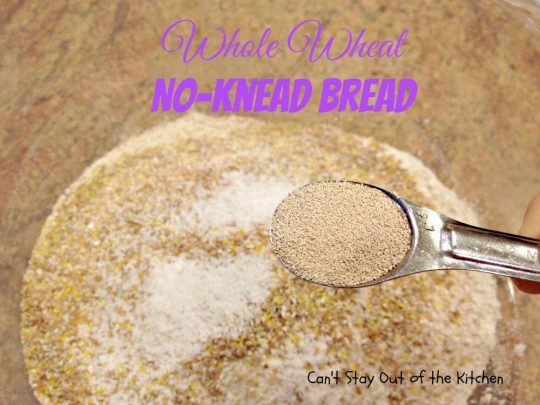 This makes the bread very dense which is why you have to have vital wheat gluten to enable the dough to raise properly. This is what vital wheat gluten looks like. Stir ingredients to combine. Add romano cheese. Parmesan or Asiago cheese will also work well. Add Italian seasoning, chives, and parsley. Add water and stir to combine. Place lid over mixture and allow to sit out on counter for 12-18 hours. Spread counter with a little flour (this is a lot more than I needed). This is what the dough looked like after 18 hours. 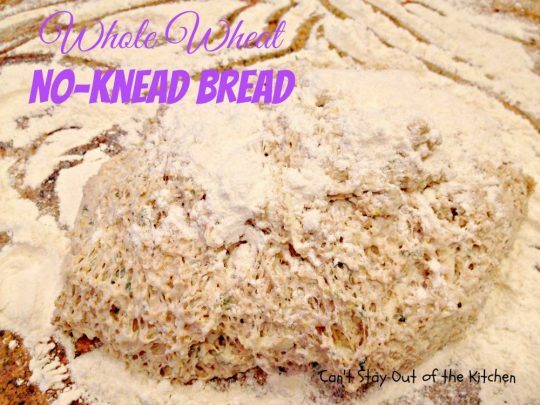 Place a little flour on top of the bread dough and work into the dough. Shape the dough into a ball. Cover the dough with plastic wrap while you heat the cast-iron Dutch oven at 450 for 30 minutes. The dough will raise again. After the cast-iron pot has been cooking at 450 for 30 minutes remove from oven and place the dough carefully into hot pan. You DON’T need to grease the pan. Cover with lid and bake 30 minutes. Remove lid and bake 15 minutes longer for a total of 45 minutes. This is what Whole Wheat No-Knead Bread looks like just out of the oven. I like to butter the tops and sides of freshly made bread when it comes out of the oven because it will soften the crusts slightly so they aren’t so tough. Be careful, though, the pan is really hot! Allow the bread to cool completely before cutting down. I used an electric knife to cut through the bread. Whole Wheat No-Knead Bread is very hearty and satisfying. It’s great served with soups like Creamy Sweet Potato and Lentil Stew or Asparagus Mushroom Soup. 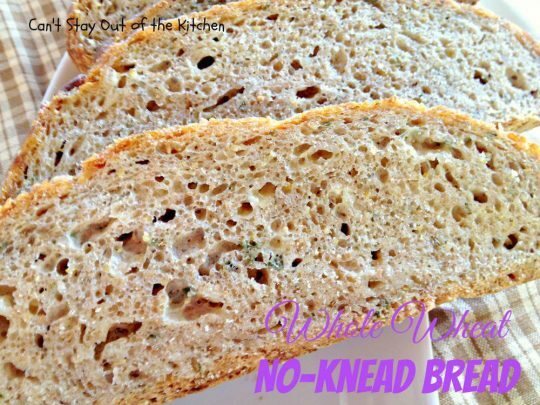 This tasty bread is also great served with casseroles like Baked Ravioli or Creamy Avocado Pasta with Roasted Vegetables. Here’s a close up so you can see the texture of this delicious, savory bread. 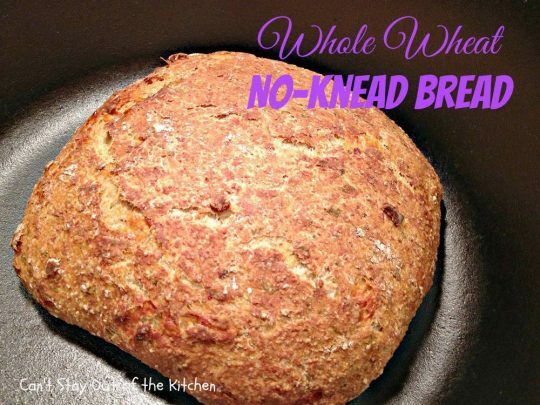 Whole Wheat No-Knead Bread is a great dinner bread for whatever you’re serving. 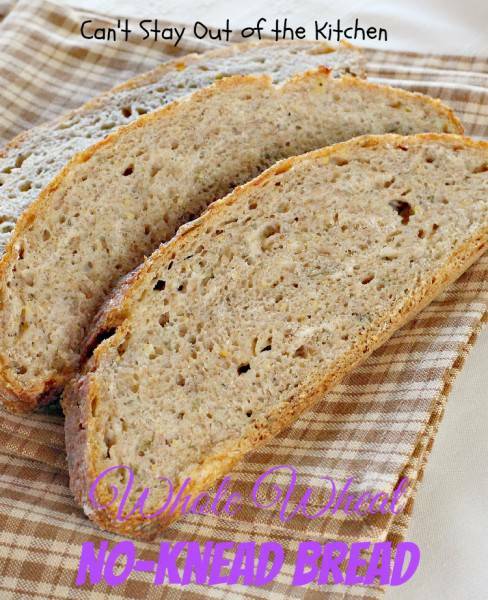 Delicious homemade artisan style no-knead wheat bread. This recipe includes romano cheese, Italian herbs, and 10-grain cereal. 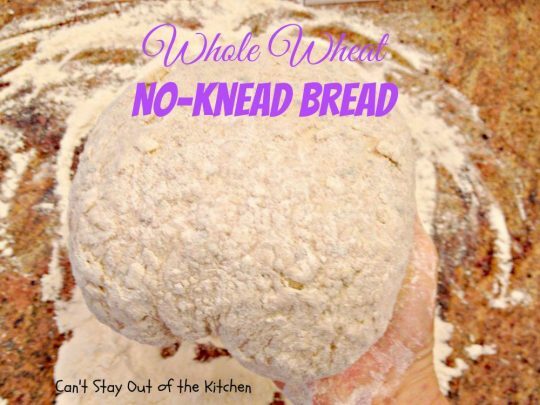 The key to making this bread raise properly is vital wheat gluten. 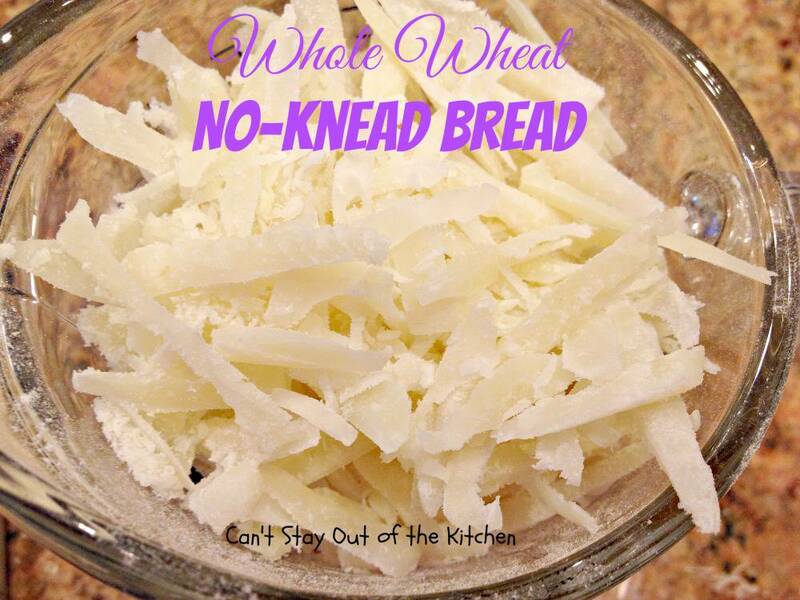 Stir flours, cereal, salt, yeast, wheat gluten, cheese, and seasonings together in a large bowl. Cover with lid or plastic wrap and allow to sit on counter 12-18 hours or overnight. When the oven has reached 450° place a cast iron pot with a lid in the oven and heat the pot for 30 minutes. Meanwhile, pour dough onto a heavily floured surface and shape into a ball. Cover with plastic wrap and let set while the pot is heating. Remove hot pot from the oven and drop in the dough. Cover and return to oven for 30 minutes. NOTE: Preparation time does not include the 12-18 hours required to allow the bread ingredients to rest. 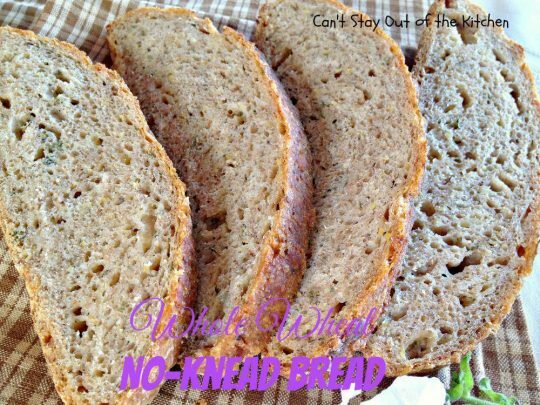 NOTE: Homemade bread has no preservatives and needs to be refrigerated after 2 days. 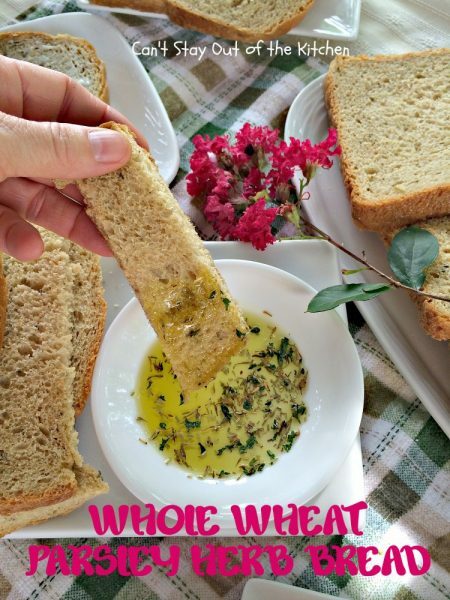 Whole Wheat No-Knead Bread is a great tasting bread to use with Fruity Spinach Salad with Peachy Balsamic Vinaigrette, or Fabulous Chef Salad. This close up shows you the texture of this great bread. If you’re looking for a healthy, hearty, whole grain bread than consider this tasty version. This healthy, no-knead bread is so easy to make. 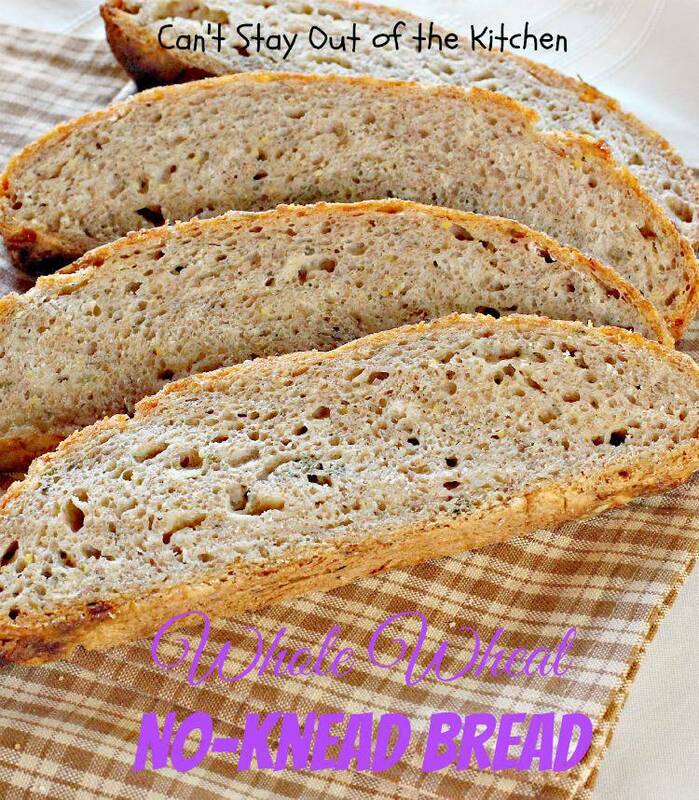 You hardly have to spend any time with it and yet the bread makes a wonderful loaf! 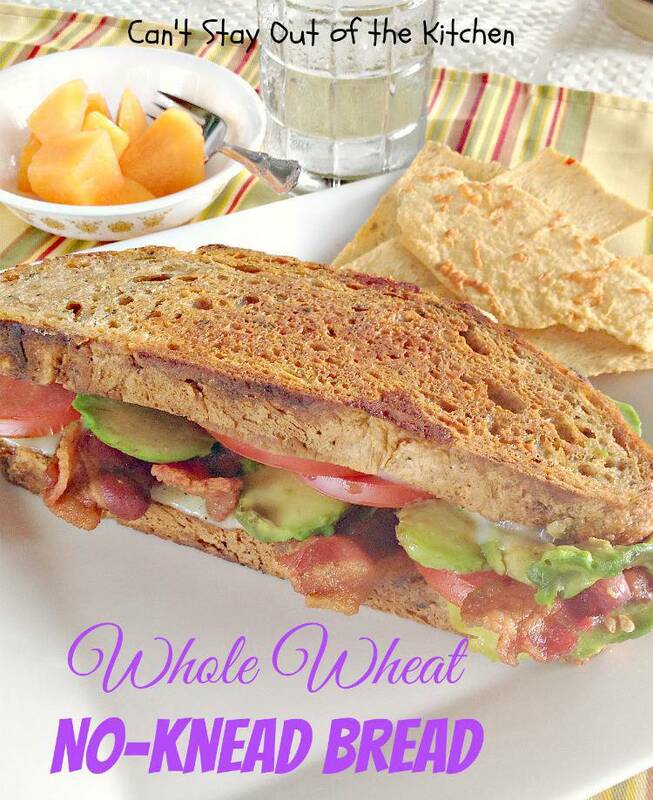 I used Whole Wheat No-Knead Bread on my Bacon, Swiss, Tomato and Avocado Sandwich. It was superb! Hi Teresa, as always, your body of work is immensely informative. Love it! I hope to give bread-making a try someday. Really, Nat, this recipe is so easy! 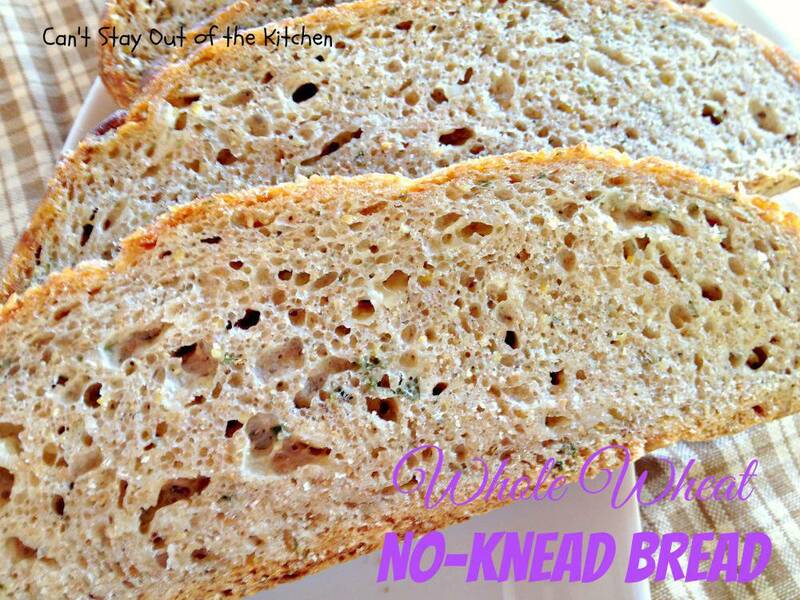 Try the Crusty Bread recipe sometime to start out. 4 ingredients and NO kneading! It’s a great little bread. Than after making you can improvise with what you want to add to it.